Amethyst Healing properties: mental, physical and spiritual from New Age and Medical Science. 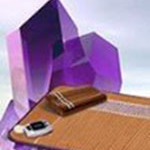 Amethyst healing is an art and practice, done on a metaphysical level that has been re-discovered because of the power of the earth’s energies that have been absorbed by these sacred objects. In turn, they inherit vital healing powers for many types of ailments. Amethyst has come to be known as a power crystal with prolific healing powers that can be characterized as purifying, pacifying and transitional. Amethyst has the ability to transform lower energies into higher and acts as a healer at all levels of mind, body, and spirit. The healing powers of Amethyst date as far back as the Greeks who believed that Amethyst protected a person from the intoxicating effects of alcohol. The world’s best source of Amethyst comes from Korea. Known for its power to detoxify the body from alcohol and other harmful elements, Amethyst also produces Far Infrared Rays. These rays revitalize the biological function of your cells to: increase blood circulation, promote perspiration, relieve neuralgia, backache, and arthritis, and eliminate toxins. 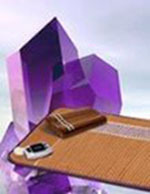 The far Infrared rays are good for relaxation, perform an anti-bacterial function and purify the air. There are many physical uses which the healing powers of Amethyst are a remedy. As an elixir, it can be used to treat tooth aches, skeletal discomforts, posture and other bone and joint-related sickness (such as arthritis). Amethyst also cures problems within the stomach and digestive tract, heart and hearing disorders. It has been known to treat various types of blood disease, and balancing blood sugar. As a healing stone or crystal it is used to treat and heal problems involving the central nervous system, and is a treatment for both convulsions and neuralgia, and contains sobering and calming qualities. This stone is commonly associated with peace. It soothes those who have engaged in constant rigorous mental activity. It has been deemed as “nature’s tranquilizer” by many healers because of its effectiveness in relaxing not only the mind, but also the nervous system. It is also known for protecting the mind from psychic attacks, and transforming negative energy into that of positive and tranquil tenacity. Amethyst is identified as a crystal that functions favorably in clearing certain types of blockage, and in aligning the chakras. By transforming energies on all levels, amethyst also has the ability to balance and stabilize energies located within certain areas. Amethyst is related to and found to heal and align ailments.